Those of you in Grand Cayman are in for a real treat. For the first time since returning to Miami this spring to assume the leadership role of our flagship kitchen, MGFD chef de cuisine Niven Patel heads back to the Cayman Islands today, his old stomping grounds, for not one but TWO events! 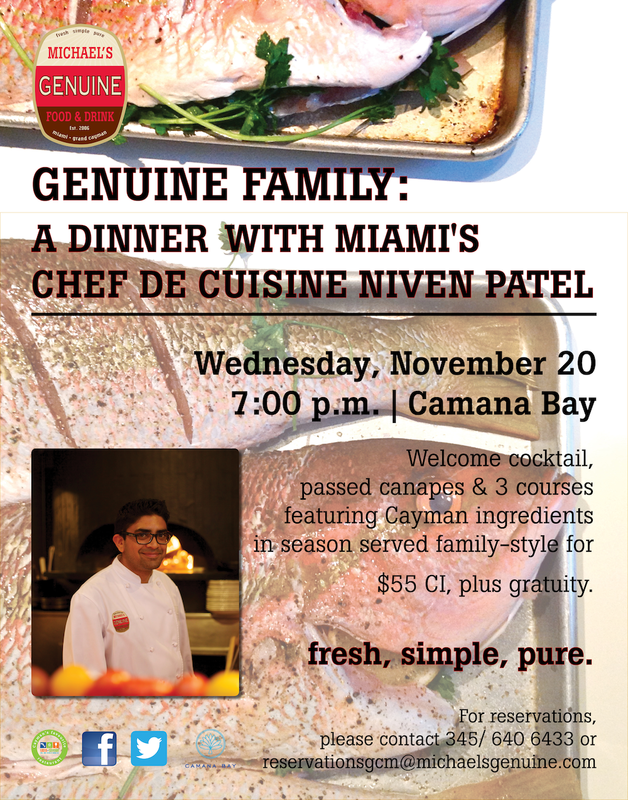 Tomorrow night at the Camana Bay restaurant, enjoy his “Genuine Family” dinner, a beautiful union of local ingredients and Indian flavors prepared the genuine way. Then on Thursday, Niven will be among several local chefs each cooking for a table of 10 at the Ritz-Carlton, Grand Cayman at “Out of the Kitchen,” its annual event benefitting a local culinary scholarship fund. For reservations, please call the restaurant at 345.640.6433 or email reservationsgcm@michaelsgenuine.com. ← [UPDATED] Happy Holiday Shopping Begins Now with a Bundle of Genuine Thanks!